Morgan Matson slayed again <3 She is SUCH a good author that my words are not going to be enough to do her and her books justice. I fell in love with her writing after reading Second Chance Summer, and Since You’ve Been Gone cemented my feelings for her and her books. The Unexpected Everything wasn’t as good as Since You’ve Been Gone, which was about Emily, someone who I connected to on all sorts of levels, but it was still pretty awesome. Andie, the main character, is struggling to reconnect with her father over the summer as he’s on leave from his political duties. Her mother died and ever since Andie and her father have drifted further and further apart. This is, of course, only part of the story, but it was one of my favourite bits. Seeing Andie and her father work to become closer again was such a delight, and I ended up caring so much about their relationship that I nearly forgot about everything else that was going on. The other major part of the book was the friendship between Andie and her three best friends. I loved that this book featured such a large friendship group, as normally you only get two female best friends, or three at most. But in this case there were four of them, each with their own personality and flaws. There was drama and tears and everything that comes with being in a large friendship group in your teens. And I was totally shipping two of the girls all the way through the book, and I was really shocked when they didn’t turn out to be gay/bi and in love with each other because there was so much chemistry between them. If these two had become a thing then I think I would have given this book five stars. The love interest, Clark, is an AUTHOR. A PUBLISHED AUTHOR. That made him all kinds of awesome. I was a bit worried that he’d be too mature for Andie at some points, but they turned out to be a really good match. Not the most memorable ship, but Clark is more memorable than he would be normally because he’s a fantasy author and <3 HEART EYES. There was, of course, the cliché second-act-breakup between various characters, and I was expecting it. But I didn’t mind so much because Morgan Matson was the one writing it. Normally that kind of think gets on my nerves, but I guess you can’t escape it in YA these days, especially YA contemporary. Oh well. 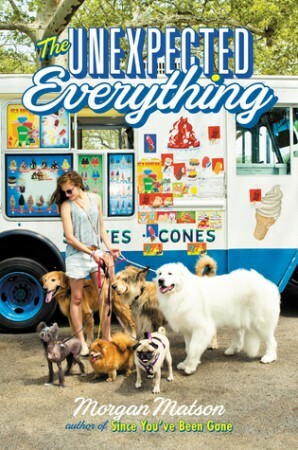 The Unexpected Everything was everything I expected it to be – a great summer novel with varying levels of friendships and relationships, featuring best friends, new romances, and a great father-daughter relationship. Add it to your TBR if you haven’t already! This sounds really fun and interesting. It seems to have perfect balance of family, friendship and romance! I haven’t read any Morgan Matson books *hangs head in shame* But I have Second Chance Summer and Since You’ve been Gone, and I kind of saving it for summer. Great review!